It is a beautiful late summer day in Warsaw. At the Constitutional Court, next to the memorial commemorating the Warsaw Uprising, hangs a giant poster “konstytucja”. Poland defends itself – once again. Again we are living in times in which it is important to defend the basic rights of a liberal and open society against their enemies. And there are conceivable perspectives from which the use of mediation is part of this defense of the open society. At any rate, I am grateful for the invitation from the Polish employers’ organization Lewiatan. They operate an own mediation center. 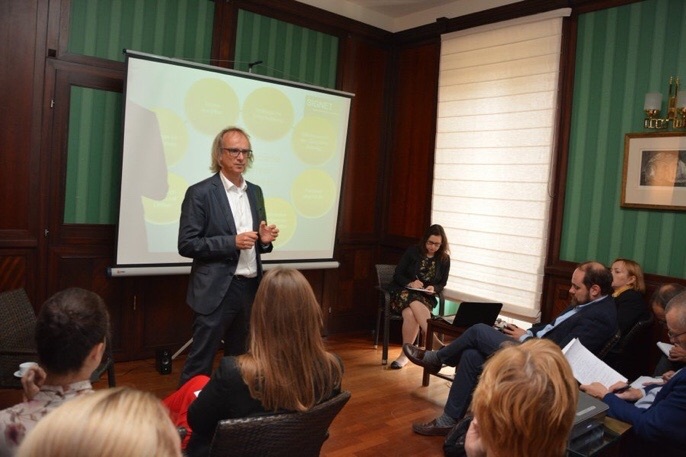 I was asked to come to Warsaw to talk about the status and development of mediation in Germany. But of course I came to learn about the situation of Mediation in Poland. Traditionally, the links between German and Polish mediators are quite close. At the beginning of 2000, in cooperation with the Association of Polish Judges, we organized and conducted the first business mediation training for Polish professionals. Today, the trainings for Mediation are conducted in renowned Polish universities. Besides the German-French partnership, German-Polish understanding after the horrors of the last war remains to be for me one of the great miracles of European history. As any relationship this one also needs continuous dialogue at all levels. Especially in times in which the political is facing specific difficulties, the other channels become all the more important. These include cultural, scientific as well as economic and social communication channels. So it was with pleasure that I accepted the invitation. The association invited a lot of interesting experts from all over Poland to this expert talks. The issue of mediation receives a slightly different attention in our neighboring country. It is very heavily tied to the courts and mediations are referred by judges to the mediation and then carried out by external mediators, who are mostly lawyers, in court. A market in the real sense of the word exists even less in Poland than in Germany if it comes to mediation. Unlike in Germany, mediators are in general lawyers in Poland. Other professions do not seem to be in this field yet. But those who do mediation are driving the topic with great commitment and enthusiasm. I was particularly impressed by the great interest of our polish colleagues in questions of how mediation is implemented and operated in other countries. Which structures, legal framework etc. exist, for example, not only in Germany but in Italy or France. The approach I presented was taken with great interest in understanding mediation not only as a conflict clarification procedure. Rather, to understand mediation as a method with which another form of business and business advice is possible. Thus, the breadth of the mediation and its field of application can be scaled and it opens up new possibilities for mediators and mediators. At a time characterized by complexity and ambiguity, and at the same time characterized by a high degree of dynamics, the mediation approach, like no other, is capable of shaping decision-making processes in a way that fosters opportunities for a better future. By framing Mediation as an approach to shape a better future, we can harvest the potential of Mediation much better. This approach was met with great interest and was then intensively discussed during the evening event to which the association had invited.